Wearable and Soft Interactions is a studio class developed for the Interaction Design department at California College of the Arts (CCA). It is now open to all disciplines under the Upper Division Interdisciplinary Studio program (UDIST). In Wearable and Soft Interactions students get an overlook of the history and rapidly developing field of Wearable Technology and eTextiles. Students will develop an understanding of the socio-cultural-political context of fashion and how to develop interactive projects with meaning. 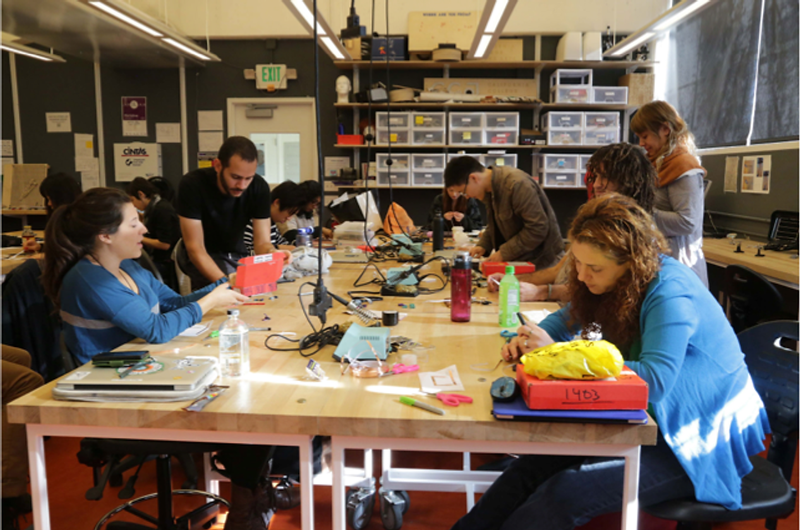 The class will introduce and dive into methods of prototyping, interactive electronics and best practices while working in the interdisciplinary field of wearables. Technology embedded within materials that bend and move can harness energy, control light displays, compose music and create remote intimacy between persons. The inverse is also true, using peripherals and sensors to effect wearable and soft displays. Students will produce prototypes using conductive and resistive fabrics, threads, yarns and will learn how to research and use alternative materials to create fashionable and flexible works. Sewable microcontrollers, sensors and components will be introduced, such as the Flora and LilyPad. Some topics offered will be modularity, power supply management, wireless communication and garment hacking skills. A final project will be developed through a series of interactive projects, skill sharing and readings.